When the 2016 Chevrolet Camaro debuted this past Saturday afternoon at a rainy event on Detroit’s Belle Isle, we brought you live images of the debut and the basic details of the next generation muscle car – but today we take a closer look at the key performance details of Camaro Six. The 2016 Chevrolet Camaro ushers in the 6th generation of the fabled GM muscle car and in doing so, General Motors completely rebuilt the Camaro from the ground up. This includes a new smaller, lighter chassis, a slightly revamped exterior design, a more comfortable interior and an entirely new(ish) engine lineup which includes the surprising return of a 4-cylinder engine option. Today, we focus on the aspects of the 2016 Chevrolet Camaro that we care about the most – as the drivetrain and handling components are the ones which GM expects will make this the best performing Camaro ever. In the intro above, I mentioned that the 2016 Camaro had an entirely new(ish) and the reason for the “ish” is that the 3.6L V6 engine is not really new, but it has been revamped for the new model year. It is the same size as the previous V6 engine, but it is a new version of the V6 engine architecture so when combined with the new-to-Camaro 4-cylinder and LT1 V8 – this new engine lineup has no carryover engines from the 2015 Camaro. First up, the 2016 Camaro has a new base model engine in the form of a 2.0L turbocharged 4-cylinder mill that delivers 275 horsepower and 295lb-ft of torque. This power seems a little light, but GM promises that the 2016 Camaro with the turbo-4 will dash from 0-60 in under 6 seconds while also offering better than 30 miles per gallon. I have driven the 2015 Cadillac ATS coupe, which shares this engine and the chassis architecture with the 2016 Camaro, and it was a very enjoyable car to drive. Next, we have the 3.6L V6 that will serve as the midlevel engine of the 2016 Camaro. This engine now delivers 335 horsepower and 284lb-ft of torque, making it the most powerful naturally aspirated V6 in the segment. The current V6 Camaro offers 323 horsepower and 278lb-ft of torque, so the 2016 V6 Camaro will be a little more potent while also being more efficient thanks to the addition of Active Fuel Management. Finally, the 2016 Camaro SS is powered by the same LT1 V8 that motives the C7 Corvette Stingray. In the new Camaro, the LT1 engine delivers 455 horsepower and 455lb-ft of torque – improvements of 29 horsepower and 35lbf-t of torque compared to the LS3-powered 2015 Camaro SS. When you take into consideration the fact that the 2016 Camaro is lighter than the 2015 models, the added power of this new engine lineup should go even further in making the new muscle car the best ever. Also, while the 6-speed manual transmission is still standard on all models, the new 8-speed automatic transmission from the Corvette could make the self-shifting Camaros the quickest of the 6th generation models. In addition to being slightly smaller, the 2016 Chevrolet Camaro is at least 200lbs lighter than the comparable 2015 Camaro. This new chassis was designed to offer improved handling dynamics and to make the Camaro SS one of the best-handling muscle cars to ever wear the SS badging – the 6th gen Camaro SS now comes with the Magnetic Ride Control suspension setup from the Camaro ZL1 and the Corvette. The new Camaro also has a drive mode selector setup with settings for Snow/Ice, Tour, Sport and Track (SS only), allowing the suspension, steering, transmission, throttle and other aspects to adjust automatically for the best driving experience possible. Top this all off with Brembo brakes and you have a 2016 Camaro SS that is promised to out-handle the 2015 Camaro SS with the 1LE handling package. While the Brembo brakes are standard for the Camaro SS, those buyers opting for the 2016 Camaro LT can opt for their own, smaller Brembo package with 12.6 inch front rotors under four piston calipers and 12.4 inch rotors under single piston calipers. However, the Camaro SS gets 13.6 inch front rotors with four piston calipers and 13.3 inch rear rotors with four piston calipers. Finally, the 2016 Camaro LT comes with 18 inch wheels wrapped in Goodyear Eagle Sport all-season tires or optional 20 inch wheels with Goodyear Eagle F1 Asymmetric all-season run-flat tires. The Camaro SS comes with standard 20 inch wheels wearing Goodyear Eagle F1 Asymmetric 3 run-flat tires. 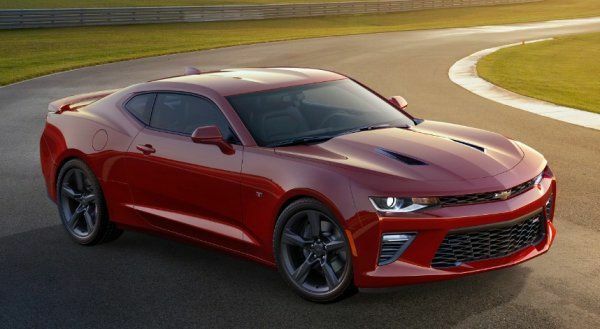 We are likely to learn more about the 2016 Chevrolet Camaro over the next few months, including fuel economy numbers and the oh-so-crucial pricing figures, but in the meantime, tell us what you think of the new GM muscle car in the comments below! Well, from what I've read and seen .. It looks like they hit the nail on the head. I'm a Mopar guy but this car looks good inside and out. Love my 392 Challenger but wouldn't mind a little weight reduction. With this new Camaro - new body and new drivetrain - GM has satisfied most wish lists. However, for many past Camaros, reliability has been an issue. Average reliability, or worse, is not good enough it today's market. Only If the quality is there will I be a purchaser. It sounds like GM hit the nail on the head with the interior upgrades and performance enhancements, but from what I've seen they missed the mark with the exterior changes. It looks too much like the 5th generation Camaro. Hopefully, they are saving those for the 50th anniversary version next year. I like what I see, both inside and out, but, I expected more of a body design change. I think there should have been more of a distinguishable design change difference between the 5th and 6th generation Camaro's at a glance. Parked side by side, I doubt if you can even see a down size at all. Not sure I want to give up my GT for this . i love all the changes to the cabin i have a 2012 rs I'm i line for the new SS already can't wait its going to blow the doors off of that ford mustang all in great job CHEVY!!!! Great specs, but the styling is basically the same, is an 8 year old design, and keeps the HUGE blind spot flaw. Too bad. I love when people talk crap! Blind spot? Have you driven one yet? I did at GM's test track. No blind spot at all! Here in Brazil have 2010 Camaro 2SS is what provides the chevrolt the market, love my car, I'm happy to have a camaro but would like to see the shrimp with motor running at 8500 rpm, but overall like the 2016 but would not trade my 2010 by 2016. Am a Ford guy but much prefer the Camaro short fat muscular styling as opposed to Mustang long and lean look. Interior is a little busy but can't wait to scan the full SS option list. Wonder how much less H.P the auto has compared to the manual trans. Gonna check the color charts out now, I'm in ! I've heard that the vs has a flaw that a part may go out in the motor that will damage the whole motor causing mandatory motor replacement. ..Love cameros but this scares me. . Is it true. .?